I have missed doing my Disney Party Boards and want to thank my friend Beth from Pursuing The Magic for the push I needed to get them going again. Her daughter, Hayley, has chosen Pocahontas as her party theme, and I couldn't help but share my party ideas with two of my favorite girls!! Colors of the Wind Cookies - Leaves are too important in this movie to not make an appearance at the party. I loved these from Sweetopia - but you can make them as simple or elaborate as you like. You can dye the cookie dough if you prefer and skip the fancy decorations. 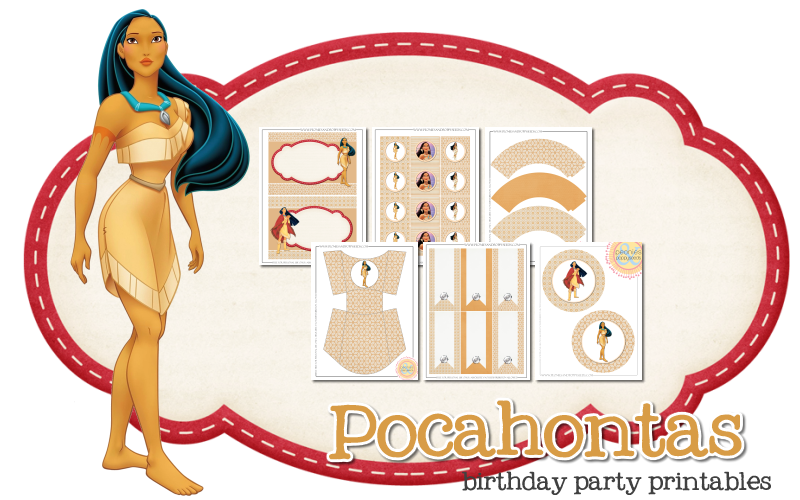 Pocahontas Invitation - There are several different versions if Pocahontas invitations at Etsy, but this was my favorite. Your invitation really sets the mood for the party so choose one that really compliments your decor. Indian Corn Necklace - I love Spoonful!! It should be your first stop when planning a Disney themed party. This Indian corn necklace is a fun activity for the kids - and they can take it home as a party favor! Corn Dip - This corn dip has a little kick, be sure to keep it on the mild side if you are feeding really young ones. TeePee - One or more teepees are a must for a Pocahontas party, right? Kids will love playing in them and having pow wows. Great thing is you can save it for your Peter Pan party, or as a great place for kids to escape the sun in the warmer months. Camp Fire - This camp fire is a cute addition to the teepee, and we don't want them to get burned while doing a rain dance around a real fire. This is a great alternative, and the kids will love it. Kocoum's Tomahawks - When planning little girl parties we often forget about the boy party goers. These tomahawks are a fun way to make sure they are included. Pocahontas Costume - Nobody makes costumes like Disney does - enough said. Fruit Cornucopia - These cornucopias are such a cute way to serve bite size pieces of fruit to your guests. They are simple to make and the kids will love them. Mother Willows Dream Catchers - Another great idea from Spoonful! Again, a great activity to keep the kids busy and a great party favor to take home. Corn Dog Muffins - The Pioneer Woman (love her) makes these with hot dogs, but I would probably use little smokies. Just the right size for little hands, and a crowd pleaser. Sugar Cone TeePees - These teepees make a great addition to the decor, but you can fill them with fun candies for the kids to carry around while they play outside too. Fruit & Cheese Sunflowers - The adorable fruit and cheese sunflowers are perfect for your Pocahontas party. Kids love cheese and grapes, and sunflowers are prominent throughout the film - it's a win/win. Compass Cookies - These cookies are a nod to Pocahonta's spinning arrow dream, and John Smith's compass which Meeko gives to Pocahontas. Moccasin Utensil Holders - I think this idea is FABULOUS (wish I had thought of it)! I also love the wooden utensils. Pocahontas Inspired Cake - This is a large cake - but I think you could just make a cake and decorate it like the center layer. I also love that it can be replicated by almost any amateur baker. TeePee Bites - I still love cake pops - no crumbs falling all over the house, and they are the perfect size to just pop into your mouth. And these are so cute! Indian Corn Favors - Honestly, DIY party favors don't get much easier than this one. What kid doesn't love Reeses Pieces too? PowWow Donuts - Got to have arrows at this party, and they don't get any better than donut arrows! These little white donuts are a childhood favorite of mine, so I had to add them to the board. I would, however, change up the colors of the tips and fletching to match the theme - perhaps some turquoise as a nod to Pocahonta's necklace. You can also find these great printables from Peonies and Poppy Seeds - as a matter of fact they have great printables all the time, you may want to check there often. There are lots more great ideas when you click the hyperlinks - #7, 15 and 19 in particular for this board. As always, a nice addition to the party decor are stuffed characters or dolls like Meeko or Flit, Native American rugs and pottery would be perfect as well. 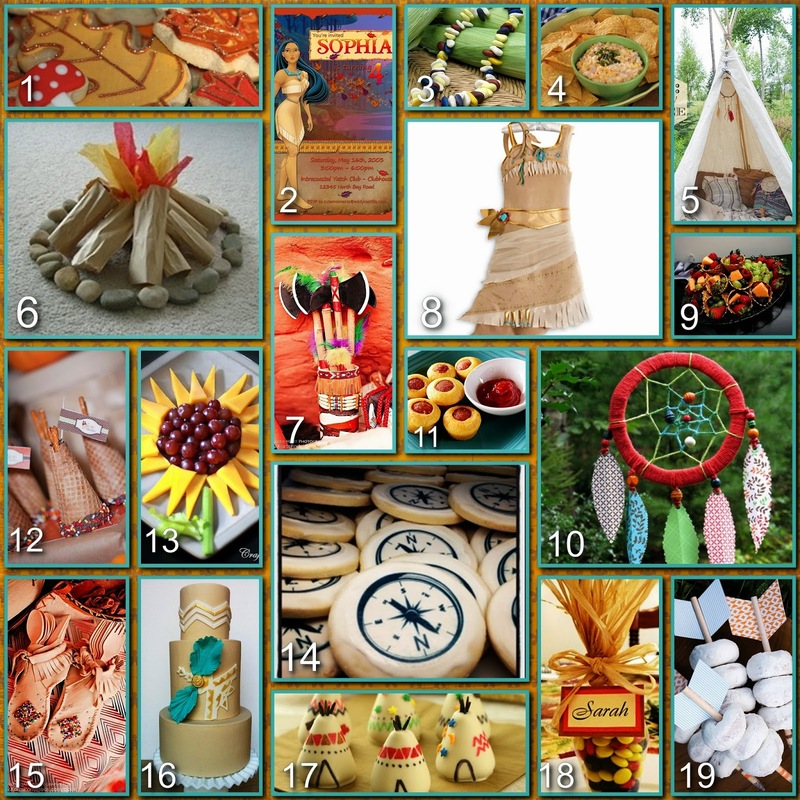 I would love to know if you use any of the ideas from the Pocahontas Party Board. Please post a picture in the comments below or on the Disney Donna Kay Facebook page!! These are such great ideas, Donna Kay! I cannot wait to get to work on Hayley's party. It is going to be so fun. The campfire is really cute! Beth, I expect to see lots of pictures. I wish I lived closer so that I could crash it!! Look at the campfire- Beth is right! I don't know what would be more fun- attending as a guest, or setting up!! Imagine sitting, (cross-legged, of course), in that tee pee and munching on a compass cookie. Beth, I can't wait to see shots from Hayley's party!! I know :D!! I get so excited planning and crafting the actual parties are just an afterthought. I know this party is going to be awesome! !